If there is one act that tends to cause more disharmony within a crew when on board a boat than any other it is anchoring and that includes the pair of us. If people watching is a hobby then get yourself down to your local anchorage mid-afternoon and settle down to watch the action. It seems such a simple task – select a spot, decide how deep it is, calculate the amount of warp or chain is needed (four times the depth is a good approximation, a lot more if it’s windy, slightly less if you’ve chain and the anchorage is crowded) then let the anchor go. Temptress has an electric windless so standing on the “down” button is about as strenuous as it gets for the foredeck crew. Watch the chain markers go past and once most of the length is out indicate to the helm so they can “dig it in” by reversing the boat a bit. Watch or better feel by resting a hand on the chain for the point when the anchor stops bumping along and ploughs its way firmly into the bottom. A quick glance round for a transit or two then watch them to see if the boat continues to move for a minute or two (if it does you are dragging so bring it all up and start again). What could be easier? Firstly there are the helms/skippers who fail to choose their spot well. Just because someone else is anchored there does not mean it’ll work for you too. We had enormous fun in Tobermoray anchored near the waterfall in well over twenty metres of water. 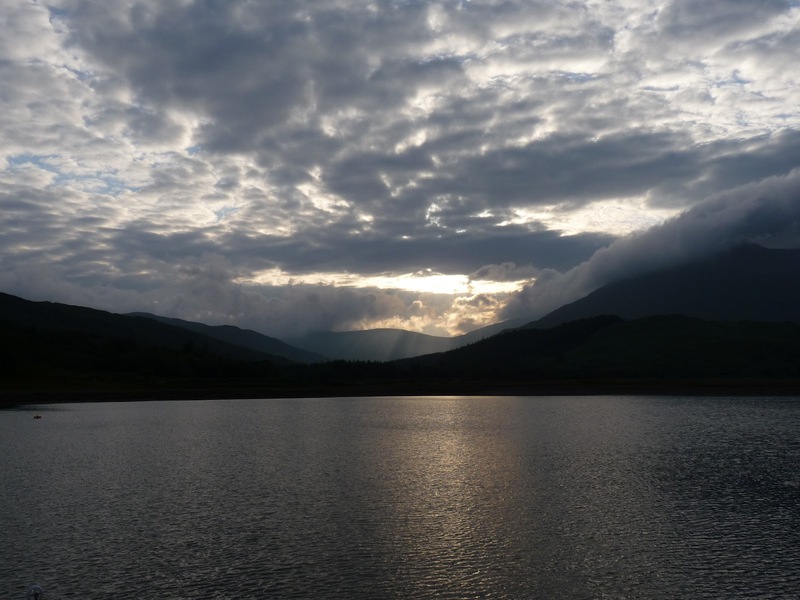 Every afternoon boats would circle us looking for that magic spot they thought we must be on where their chain would reach, eventually after say their second circuit of Temptress, yelling across to ask us how deep. We’d confirm it was 23 metres at high water resulting in them scuttling off across the harbour with their crew muttering I told you so’s. Next are the boats who look at the crowd and decide the isolation of the other shore of the loch is the place for them regardless of the fact that it might be exposed to the entrance and the wind is whistling in (cf a large Westerly in Loch Aline who must have had an uncomfortable night as they moved over to be closer to the crowd early in the morning), or yet others who quite clearly haven’t examined the chart well enough and end up in danger of swinging into a currently submerged rock or bank when the tide turns (we’ll own up to doing this in Chi Harbour many moons ago and spent an uncomfortable few hours lying at 45 degrees on the sand) . Then there are the helms who have to go to the bottom of the class when it comes to observation. They arrive at their chosen spot via a lengthy tour of the harbour, patience running out as they’ve had difficulty finding a suitable anchorage, yell at the crew to let the anchor go and reverse. All the while failing to spot that every vessel is lying at a completely different angle to their approach. No problem until their vessel loses way and starts to come under the same tidal or wind influences as the rest of us when it swings slowly round putting them far too close to another boat or boats or even the shore. And the one that causes Temptress’ crew the most issues, a foredeck and helm who fail to communicate. You can’t hear one another over the engine and rattling chain when almost fourteen metres apart. If the foredeck hasn’t established before leaving the cockpit roughly how deep it is and if the helm isn’t watching signals from the foredeck then it is all certainly not going to go well. How much chain to put out? A problem with chain wrapped over itself, pinning it firmly in the locker half way through the process? Not digging in and needing to come up again? Realising we are going to end up too close to land, shallows or another boat? We’ve had them all happen and finding the other not paying attention specifically to us, we end up blaming each other when in fact shouting information is pretty futile, hand signals are more useful so we should be watching the other crew as well as our task in hand. Fortunately neither of us bear a grudge for long and once settled in the cockpit G&Ts in hand all is harmonious once more. Then there is the weighing (ie raising) anchor palava the following day. Here we pride ourselves on having a good system of arm/hand signals employed by the foredeck and they rarely fail us. Exaggerated pointing towards where the chain enters the water (sometimes it is behind the bow) ensures the helm manoeuvres the boat according to the foredeck’s wishes. Our chain falls into a pyramid directly under the windless and usually during the process of bringing it up that pile eventually grows high enough to prevent additional chain being added, a distracted foredeck can end up with a mess of jammed chain on the windless if they aren’t paying close attention so getting a lot of chain up can often take some time, the helm needs patience and the foredeck perseverance. A raised closed fist by the foredeck indicates to the helm to put the engine in neutral. Finally a big thumbs-up when the anchor is clearly visible coming up so the helm is aware that they now have responsibility for the boat’s movement and can head off slowly. 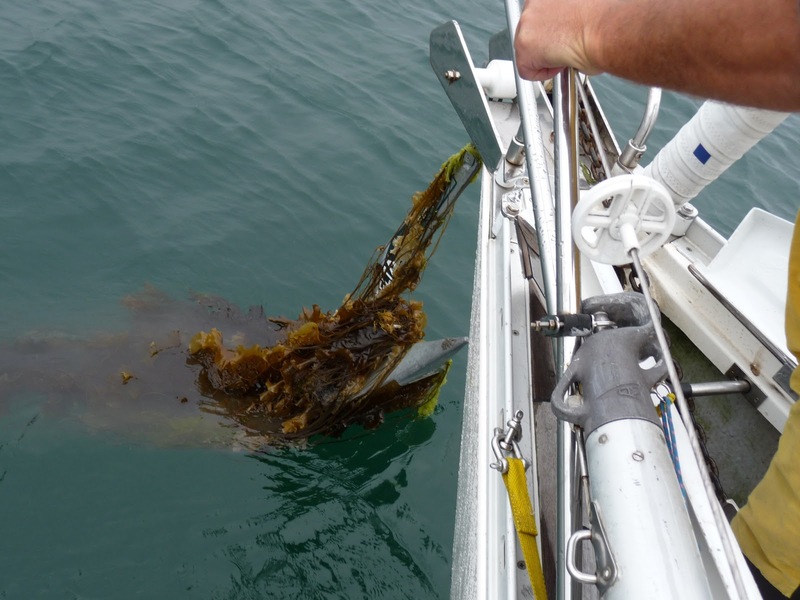 At this point too there can be extra fun for the people watcher; kelp or another obstruction lifted with the anchor. Once in the Solent off Newton Creek Temptress’ straining anchor windless brought up our old CQR jammed in a huge tree bole which required assistance from friends with other boats to remove and we’ll also admit to hoicking up discarded fishing gear or some other cable whilst kedged in the English Channel miles south of the Isle of Wight during an offshore race much to the surprise of the entire crew, fortunately that slide off gently as the anchor tipped. Over the years though we’ve observed that often crews are completely flummoxed by the additional object on the anchor but it usually is calmly sorted it out with a bit of ingenuity by the skipper. 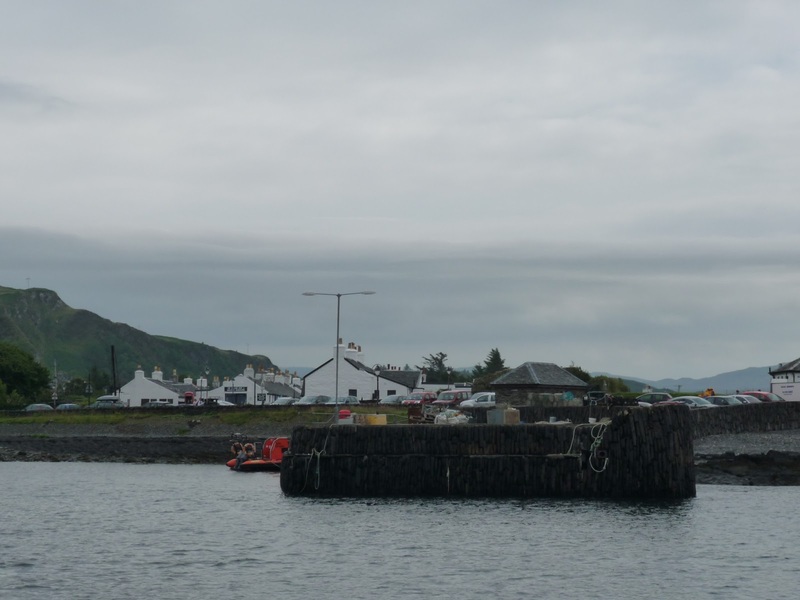 In Bunessan on the Isle of Mull and later after a lunchtime stop in the picturesque but tiny Easdale Sound weighing anchor resulted in bringing up a complete camouflage canopy of kelp which took some contortions with the boat hook to lift clear bit by bit. Our once shiny new Delta is finally starting to look used. 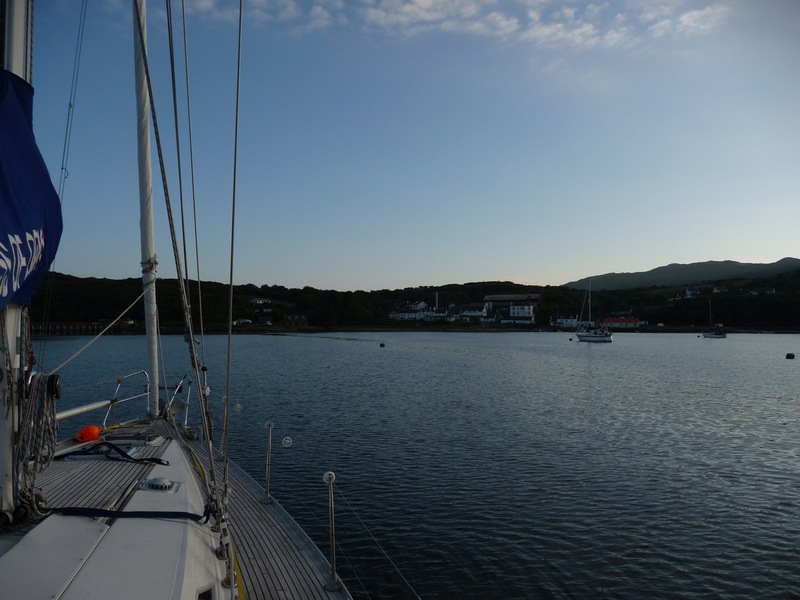 We managed continuous fourteen nights at anchor in various places over the past few weeks, then one variation, picking up a mooring in Loch Melfort (another procedure needing close co-operation between helm and foredeck if it is all to go smoothly) and Thursday night (July 18) another splendid anchorage where it took us two attempts to lay forty metres of chain. The bottom, judging by the anchor when it finally came up after attempt one was gloopy grey mud and stone but this being a fairly popular spot close by Ardfern Marina at the head of Loch Craignish it probably has been churned up by much use, hence our difficulty in getting the anchor to set firmly initially. But in all this despite a few skirmishes we’ve not had a serious falling out between bow and cockpit, the processes of both anchoring and weighing anchor are becoming well-honed and swapping roles frequently ensures at any rate we share the burden of being in the doghouse! All harmless fun for the onlooker but watching some crews’ anchor it seems it could be the straw that breaks a relationship. Take heart if you are one of those muttering crew thinking mutinous thoughts, boating is a continuous learning process…. providing much amusement to the spectator. 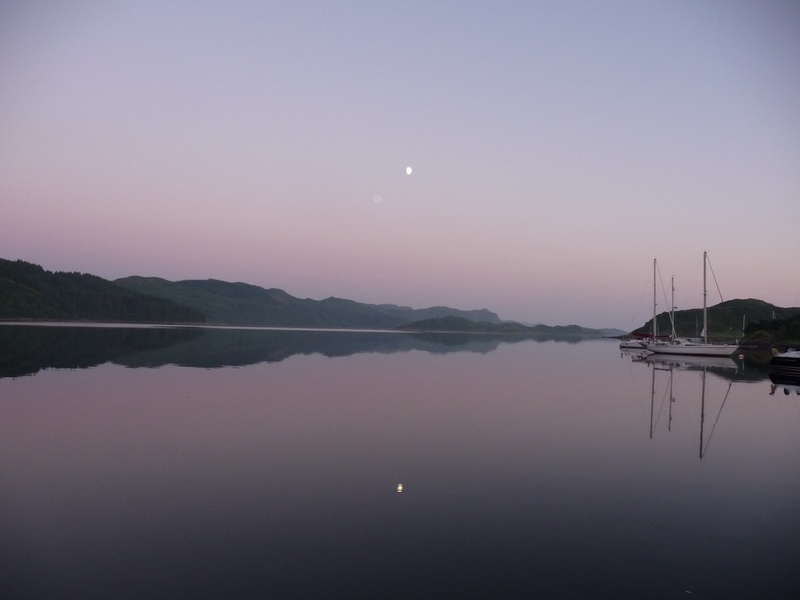 Ardfern anchorage at night – why we do it!